In Kannada, Uppu means salt, and sajjige means semolina / rava/ sooji. This quick upma-look alike was made by grandmom every thursday and saturday for her palahaaram (fasting) when she wouldnt eat rice based dishes. In fact, she relished only this kind of upma even sans onions or garlic, especially when her ultra-orthodox elder sisters came over. It requires exactly 10 mins and 3 ingredients. Let's see how to make this. In a pan, heat half the ghee and roast the sooji on medum flame till nicely roasted. Keep aside in a plate. In the same pan, heat the remaining ghee, splutter the urad dal, curry leaves if using and hing till urad dal turns golden brown. Add the water and bring to a rolling boil, add required salt and slowly stir in the roasted sooji. Mix well to prevent any lumps. Cover and cook for 5-7 mins till soft and well done. Serve immediately. This goes to BM # 85 under "Cook with 3 ingredients or less"
This looks like a simplified version of Upma. A good one for 3 ingredient recipes. What a quick and easy dish that is. Simple and delicious. 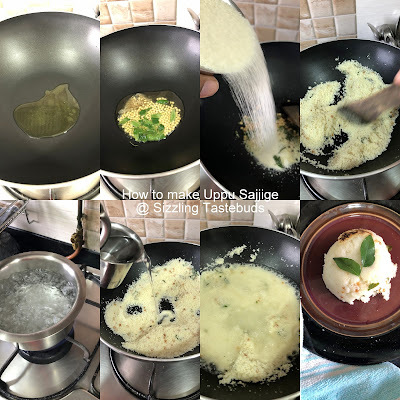 Super easy and a fabulous version of Upma Kalyani, lovely dish. Simple and perfect for my little one! Upma is my favorite dish. This one is easy version of the same. Good one! really satwik food. easy and quick to make. Quick and easy dish and healthy too. Love this quick version of upma. That is one quick and easy breakfast idea. Keeps you filled up or a while as well.